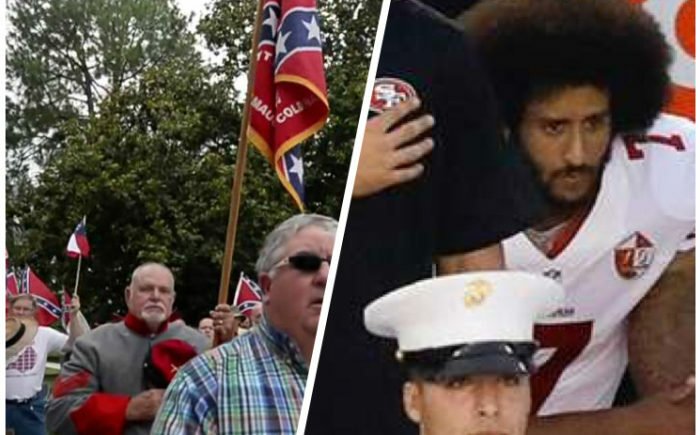 (updated 03/2017) Colin Kaepernick decided not to stand for the Anthem…he did it because of his conflict with the words of the Anthem and the image the Anthem represents, against the backdrop of the experience of Black and Brown people in this Country. The NFL has responded to his kneeling by seemingly locking him out of the League. Their action reinforces the issues we uncover on this podcast. But what do we do in the face of such racism? Even if we’re not sports fans…is this something people of God should consider? Now, I (Fr. Jabriel) have spoken in another podcast about ways Black people can be authentic to themselves amidst the complexities of American mythology. But, Colin Kaepernick doesn’t have to agree with my point in order for me to see the peculiarities that he’s now facing as a result of his protest. In this episode of Racial Heresy, Fr. Cayce Ramey and I explore the strange relationship we Americans have with the Flag, the Pledge and the Cross of Christ. What do you think? How do you respond to the racial doctrine we uncover and the way it needs to be resolved? We’d love to hear your thoughts! Are You A Racial Heretic on Facebook? Click the image and start your application over on Jahbread.com to become a part of the solution to the racial divide in America. We look forward to having you join us on this journey! ← Personal Salvation and Collective Sin: Can You Have One without the Other? Here we go again, a twisting the truth to complain about racism. Maybe there’s a different NFL I never heard of who actively locked him out, but there’s a very simple reason he never got an offer to play: teams want a quarterback, not a political news figure. But that’s too boring of a reason and doesn’t give any room to complain about racial issues. Ever wonder if black people themselves are causing this ‘divide’ by constantly making the news with outcries against racism and equal rights? Maybe learn from Asians, for example. They are way more integrated into the American people than African Americans. Why? Because they focus on working hard to contribute to society, not looking for the next excuse to riot against racism. But you won’t even give my words any thought, and will send out more ridiculous posts like this one and keep dividing us further. So thank you in advance for keeping us the Divided States of America. Good job. I (the Black man) am grateful that you would feel encouraged to share – even in your tragic ignorance. It’s interesting that White society creates a problem (White supremacy) then blames Blacks for not abiding such ungodly sin. It’s like you would prefer that we – Black people – show no love for you whatsoever…that we would be as ungodly toward you as you have been toward us. Yet, God wishes not the death of the sinner…but that he (the sinner – i.e. White society) would repent and live. And, by your response, it’s made crystal clear, that left to yourselves you’d never see a reason to repent. And THAT, Sam, would be truly a tragedy. May the Lord strike the heart of stone within you, with His comforting rod, that living water might flow forth!